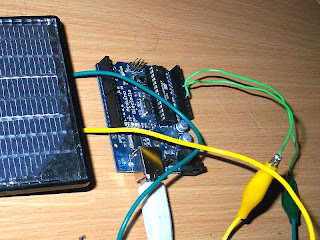 Someone asked me if it was possible to connect a solar panel to an Arduino board and then read the information in Max/MSP. This setup was only tried with inside lighting. A different data range will be present if natural sun light is used. 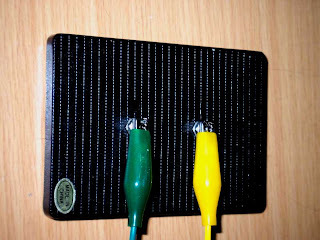 • The solar panel used in this example was rated at 2V and 25mA. • If data values appear incorrect, try scaling the byte 'data' in the Arduino sketch as it is captured. The analog inputs read data at 10 bit. However, a single, serially-printed value can only hold 8 bits of information. • The data range with this particular solar panel is 0 < 6 using power-efficient, indoor lighting at night. 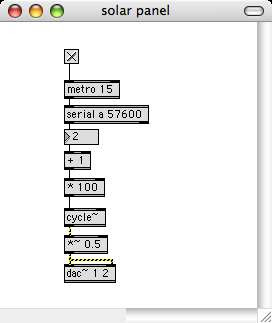 Here is an example of a very simple Max/MSP patch. The value of the solar panel determines the frequency of a sinewave as being of the harmonic series with a fundamental of 100Hz. Now that would have been cool to do in forum. Well done on keeping the blog up to date; you're one of the only postgrads who bothers anymore. Oh, hey Ben. Hope you are goin well and all that. This would have been fun? Didn't we connect an LDR to the Arduino (as far as i recall)? The outcome is so much more sensitive and playable, and the range of data is much larger. Also, i really enjoyed your piece at the end of year show 2007 -- nice work. Indeed we did, however I figured an actual solar panel would be a little more dynamic. hye..it is ok if i using solar cell 5V 50mA? beautiful and attractive with the decorative accessories.All of us love to surround our world with things, which are both beautiful as well as exotic. Our homes are one of the most intrinsic parts of the world around us.